Vs. Super Mario Bros. © 1986 Nintendo. 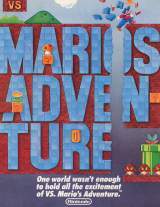 Classic and cult horizontal platform game featuring the Nintendo mascot Mario who must save princess Toadstool (Princess Peach in Japan) from Bowser (Koopa in Japan). Vs. Super Mario Bros. is most common in a converted "Donkey Kong" or "Donkey Kong Junior" cabinet (this game was only available as a kit, there were no dedicated cabinets made). Actually, any copy of this game that is not in a converted Donkey Kong series cabinet is incorrect (as the Vs. kit was only designed for those cabinets). Nintendo designed a special small joystick for their Vs. Unisystem games (allowing a 2 player setup on the tiny Donkey Kong control panel). Another difference between this title and most standard games was audio that was processed in the monitor (although this was the same as most other early Nintendo titles). One other notable thing about this title is that either joystick will control either player (most Vs. titles were like this), making it rather pointless to have 2 sticks in the first place. * Item placement in the '?' and hidden blocks differs slightly, so if you're used to the Playchoice-10 version you may find a few different and unexpected items in certain familiar places. 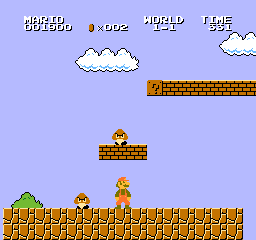 * Parts of levels were also changed slightly, too, the most noticeable being a gap in the ceiling bricks on the way to the Warp Zone in World 1-2. * This seems to make the World -1 trick impossible to do on Vs. Super Mario Bros., as it involved the use of these removed bricks. * Bug fixes / preventions. 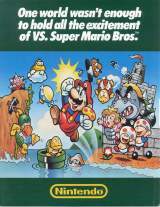 This game is also known as "Vs. Mario's Adventure". A hack of this game where made by Two-Bits Score and is known as "Skate Kid Bros.". A Vs. Super Mario Bros. unit appears in the sitcom 'Two and a Half Men'; Season 5, Episode 2 (People Who Love Peepholes). * Increase The Number Of Marios By 100 Or More : There is a way of increasing the number of Marios by more than 100. At the end of World 3-1, when Koopa Troopa comes on the block stairway just before the flagpole... and reaches the lowest step, jump on him to make him stop moving. * The 999 Timer Bonus Trick : This one can be done on any of the -4 Worlds. It is most difficult to achieve on World 6-4 and World 7-4. What you do is try to end the level with the timer at 000, and the machine will act as though you have 1000 units of time instead of 0. It will drop to 999 and count down to 000 from there and award points for each unit of time. Simply jump to the axe as the timer goes from 002 to 001 and you should finish the screen with the timer at 000 and get the maximum bonus.